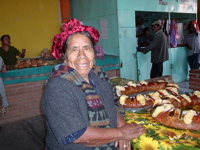 Las Abuelas (Ah-bway-lahz), the grandmothers, come together at Teotitlan market every morning to shop for the day’s meals for their families. 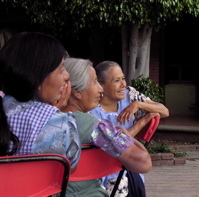 The daily morning market is essential to the social fabric of village life for older women, a time to socialize, exchange news, and for some, I hear tell, take a nip of sweet flavored mezcal together, a ritual, I suppose, to seal their sisterhood. The abuelas get to the market via tuk-tuk, riding in the front seat or flatbed of a battered pick-up or by foot, carrying on laps or under the crook of their elbow the traditional shopping basket woven from split bamboo and trimmed in wide palm leaves. There is a status associated with the baskets: the fineness of weave, size, and added decoration, such as miniature baskets suspended from a garland encircling the perimeter. The grandmothers wear their hair in braids woven with ribbons. Mostly, they are burgundy red. They can also be brown, green, blue and yellow. I don’t know if there is a significance to the color, and this is something I will need to find out and report on. My guess is that each village has its own color preferences and customs. The women from Benito Juarez and Santa Ana del Valle and Tlacachuaya will have a variation on this theme. Sometimes, the braids hang loose and and tied together at the end forming a V down her back. A braid will extend far beyond the waist. Sometimes the braids are wrapped around the top of the head and give the appearance of a crown. This is useful, too, because a basket can be carried on the head, balanced, as the woman walks along with a grandchild in tow or with arms swinging free or carrying a bouquet of flowers for the home altar. The grandmothers wear the traditional handwoven, cochineal dyed wool wrap around fabric that is the skirt (falda). It is tied with a sash (fajas) that has a balled tassel on the end. The blouse (blusa) can be cotton and hand embroidered or commercially purchased. Sometimes, the skirt is a subtle check and the blouse is a polyester floral, having no particular significance other than personal preference. The costume is then complete when it is topped with a checked and machine embroidered or applique apron. In the market, the wife of a local English teacher (a man who lived in the states for 15 years before returning to Teo), sells intricately embroidered aprons. This is the “overblouse” uniform of village women from Mitla to Tule. Most buy aprons at the Sunday market in Tlacalula where the selection is so vast, over 50 different stalls of apron vendors or so it seems, in every shade and color combination. Aprons sell for 120 to 250 pesos depending upon intricacy of design, and whether both the front and back are embroidered. Scallop edges, huge flower or animal designs, embellished pockets and button closures will command a higher price — one more symbol of economic position in the community. To find these stalls in the market, you have to wander way back beyond the food vendors — ask: A donde estan los mandiles? Mandil is the Spanish word for apron. Few of the young women who stay in the village are wearing this traditional dress. Jeans, Gap or Tommy Hilfiger t-shirts and sweat shirts, and Nike tennis shoes are the ubiquitous uniform of teens and young adults worldwide. Young matrons of the village in their mid-20’s to 40’s will wear a store bought dress topped with an apron. Only the grandmothers carry on the traje tradition. In a few more years, will this be a memory captured by our photos as cultural traditions change and adapt and become subsumed by the dominant culture. I marvel as I sit in the market or meander down the streets at the tenacity of these women, their strength and fortitude and beauty, their survivorship, and wonder what the village will look like in 30 years when they have passed on. Will their dress be part of the museum exhibit only to be brought out during the annual July village fiesta that features the parade of the canastas? And I ask myself, am I being a romantic, romanticizing a way of life that is destined to change? This entry was posted in Clothing Design, Cultural Commentary, Teotitlan del Valle and tagged Clothing Design, mandil, Oaxaca baskets, Oaxaca grandmothers, Oaxaca women, Teotitlan del Valle, Teotitlan market, Tlacalula market, traditional dress, traje, women and mezcal in southern Mexico. Bookmark the permalink.